I have been on a clean eating diet for the last couple weeks for a weight-loss program I'm doing at the gym. It's mostly high protein and low carb. 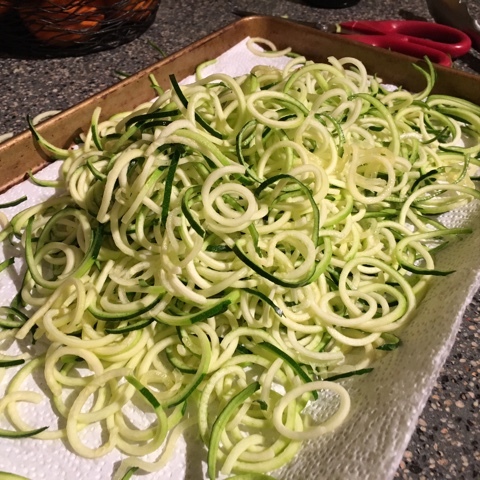 Eating meat and veggies gets a little boring every night for a foodie like me, so tonight I decided to make it a little fancy and pull out the spiralizer. This is the spiralizer I have from Amazon. I love it and use it several times a week. It's pretty simple to use and most vegetables can be spiralized in advance and stored in containers or plastic bags in the fridge. 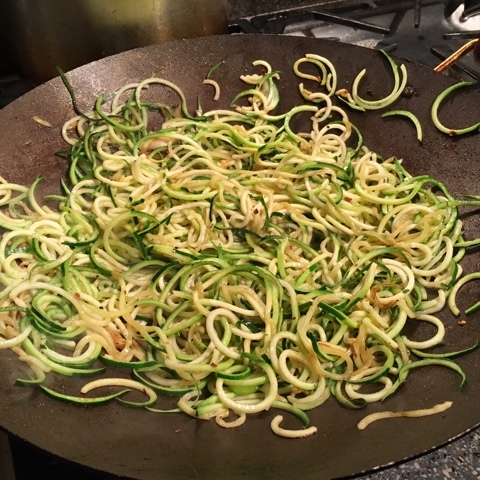 Zucchini noodles also cook incredibly quick (1 to 2 minutes). This dinner was delicious and very healthy. I decided to cook it using a Japanese Hibachi style by using a very hot pan or wok and seasoning with bold flavored. The best part of this meal was that only took 15 minutes to make! Heat a large skillet or wok over high heat. Cooking shrimp is incredibly easy. I buy the bags of frozen jumbo shrimp that are already peeled and deveined. Once they defrost (only take about an hour or two), I rinse them under cold water and remove the tails and the peel (they come off very easily). 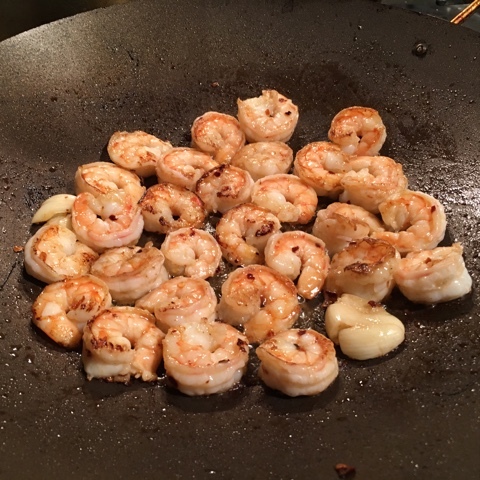 Make sure you dry your shrimp really well before you add them to the pan. This is what helps them to get that nice brown crust on the outside. Drizzle one teaspoon of olive oil in pan and add shrimp. Squeeze fresh lemon juice (about 1 tablespoon) over the shrimp. Add the garlic, crushed red pepper flakes and a pinch of salt and pepper. After 2 minutes, using tongs, turn the shrimp over to brown the other side. Add the soy sauce (I use Bragg's Liquid Aminos) and cook for another minute or two. Shrimp cook very quickly so don't walk away. Once the shrimp are pink and cooked through, remove to a plate. Leave the garlic in the pan. Add the remaining teaspoon of olive oil to the pan, and add the zucchini noodles. 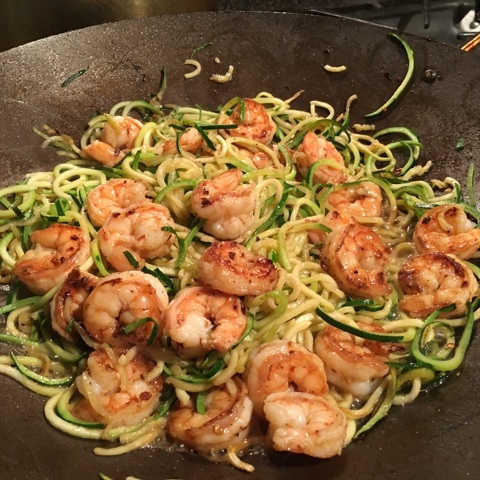 Cook for one to two minutes until zucchini noodles are just starting to cook and add the shrimp back in. Turn off the heat and squeeze more fresh lemon juice and if needed, more soy sauce.